Add this issue to your photographic library for techniques on starting out with a Canon EOS camera, bulb mode, in-camera raw processing on the EOS 60D, avoiding overexposure and polarising filters. World of EOS Photographic projects and news from the world of Canon imaging, including the new Cinema EOS system. 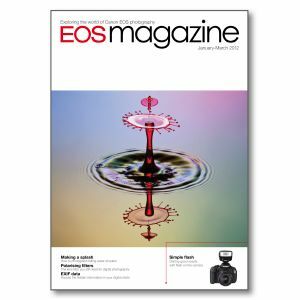 Forum A round-up of recent activity on the EOS magazine forum. Starting out An introduction to some of the features of digital single-lens-reflex photography and taking control of your EOS camera. Time exposures With high ISO values available on EOS digital cameras, why would you need to shoot with long exposures? Criag Roberts looks at situations where the exposure time is measured in seconds, or even minutes. RAW power The EOS 60D features a first for EOS cameras – in-camera RAW processing. Is this a gimmick or a genuinely useful feature that can cut down on the amount of time spent on images in post-production? Masterclass Fashion and portraits with WInter Kelly. Light control Nothing ruins a digital image more than burnt-out highlights. Andrew Gibson explains why this happens and shows you how to avoid overexposing the lightest tones in your photographs. How was it shot? Corrie White introduces us to the art of water drop photography. EOS care Protecting your kit from extreme weather and unforgiving environments will prolong its life and maintain its performance, says Tracy Hallett. And sometimes cameras and lenses need protecting from neglectful owners! Pola filters Do you really need lens filters for your digital EOS? All the effects can be added after the photo has been taken, can't they? Well, mostly, but there is one filter which is essential for photographers, says Chris Mattison. EXIF data Every time you take a picture, your EOS camera is capturing more than just a photograph, says Tracy Hallett. Dig a little deeper and you'll find a host of data that will help you take your photographic technique to the next level. Simple flash Using electronic flash can be very complicated, with multiple Speedlites, wireless control and flash ratios. But it can also be very simple. All you need is built-in flash or a Canon Speedlite to add some sparkle to your images.